I also used a high quality paint brush (Wooster and Purdy brushes are my favorite) and a mini roller with a head made for smooth surfaces. As far as the doors go, I highly recommend painting the back of each door first. That way, the front side (the side that will get seen the most) will be the last thing you paint. I started by painting the recessed edges on the back side of each door with a paint brush because it’s easier to get into those areas with a brush then it is with a roller. Then, after I had all the recessed edges painted, I used my mini roller to paint the flat parts of each door. Doing it in this order is the best way to go if you’re looking for a smooth finish with minimal brush marks. Also, the key to the roller is to not over load it. It’s better to do several super thin coats than to glob on a couple of thick ones. Once the backs were coated (four times), I flipped the doors and did the same thing on the front sides. We’re putting the doors back on this morning (they’re closed for this photo, but we’re going to leave them open til Monday), and then I’ll get started on the base cabinets. PS- You can read about the type of paint we’re using HERE, and for up-to-the-minute kitchen makeover updates, join me on Instagram! 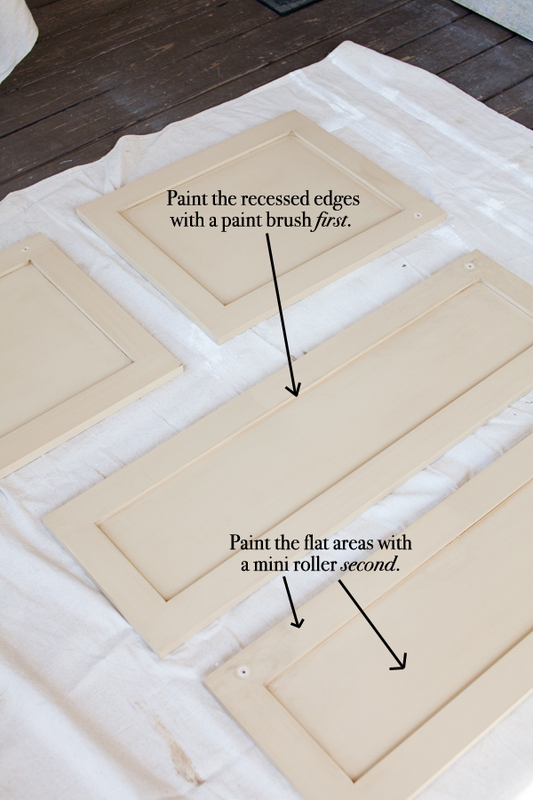 These posts have been so timely because we’re painting our cabinets this weekend! We got a sprayer but I think brushing/rolling the bases of the cabinets will be easiest. Might have to try those little pyramids! I’ll be excited to see the rest of yours as we do our own! Redo is looking great! I was curious about the grey paint color on your kitchen walls? Love the crisp white next to the pale blue backsplash…gorgeous! 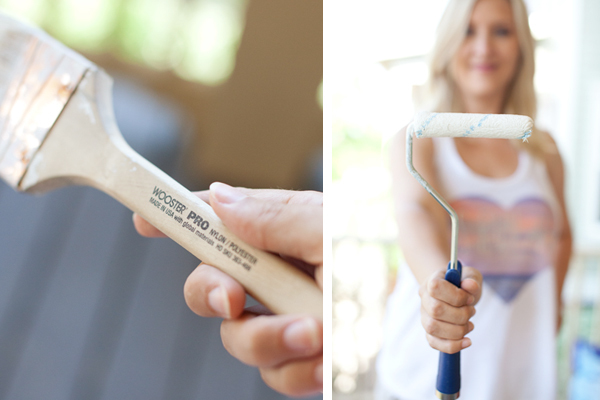 Thanks for the helpful painting tips…great to know that Wooster is your favorite brush. Bon courage with the lower set… you can do it : ) Hopefully you will feel inspired looking at the beautiful already painted ones. Where did you find the little pyramid things? Super good idea! I plan to paint my kitchen cabinets this summer. I’m still trying to decide between two very different colors, cream or navy. Thanks Sarah. I bought 6 packs from Home Depot at $4.97 each. I have 25 doors and 5 drawer fronts I have to paint so I was happy to see info about these posted. I also checked Hobby Lobby’s web site and the pyramids are $6.97 or so. $2.00 more a package much more than the Home Depot. I lived in Wooster, Ohio where the Wooster Brush Co is located, so I always buy those too. We just finished painting our cabinets this week and are letting them cure until Sunday. We haven’t had doors since April 12th, I am beyond excited! Your kitchen is looking cute! I am loving it! My fave has always been a white kitchen. And your tile work is looking even more awesome with the light colored paint. I love the way this is turning out. I have an older style kitchen (builder grade oak cabinets and laminate counters) and I have been thinking I want to paint the cabinets. I’m scared though. Our backsplash is square tiles that look kind of “Earthy”…like rocks almost. I’m just not sure if I’ll regret painting them white or if I should go darker… thoughts? Hope you don’t mind my comment. Do you love your backsplash? If not, take it off and put up something you love! If the rest of your house has no white, if you have earthy colors, browns etc then you could paint the cabinets a warm white. Your current back splash will be better with a warm white. If you are looking for a new timeless back splash, subway is great. I adore Layla’s back splash so I am thinking of using her color in subway. Sorry, Layla. I tried to leave the a link for Jennifer on your island color decisions, and it didn’t work. I couldn’t figure out how to delete my message either. I am just not too tech saavy sometimes. Hey, great job! I am (now) obsessed with seeing brush marks on the cabinet doors. We visited a local cabinet maker and this finish was beautiful! I am going to do the doors each way and see what I think! Cannot wait to see your project finished! The cabinets look great, but I LOVE your rug! Where’d you find it? Thanks, Layla! I will definitely be getting some of the pyramid things- I will be starting a project soon! Your kitchen is looking fabulous! 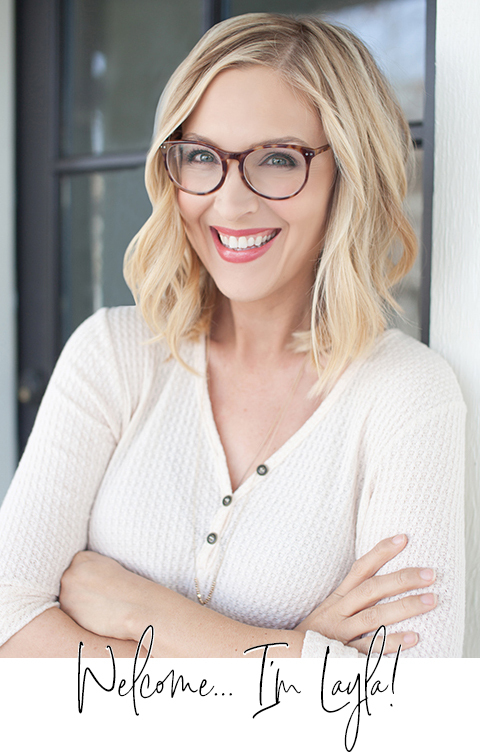 Carrie - Curate & Co. Looking good ! I thought you like Purdy brushes ? Just finished painting my kitchen cabinets, and your pointers are spot on. Starting on the backside of the door means you don’t have to worry about scuff marks on the front side. It is important to have something that will provide space between the cabinet door and the surface you are painting on. I found an empty cardboard box was perfect for providing stability while letting me paint the edges. I used Sherman Williams paint with an extender additive. This allowed me more time to roll out the paint to get a smooth finish. I used a sponge roller, and it did a great job. Your cabinets are looking great! I know from experience it’s a tedious job, but once it’s done it looks great. I have been waiting for you to do your cabinets so that I could follow your advise. I cannot find the paint that you used on your cabinets here in Vermont. After your first post I sent an email to the company asking if they would be opening a store in Vermont but no response from them. The closest to me is 2 hrs. drive in New Hampshire. Do you feel that this paint is worth a 4 hour drive? I usually use Benjamin Moore but was not happy with the last cabinets I painted and was looking for something better. Where did you get the triangles to hold the doors up. I love that idea. Thank you for your posts they are already so helpful. Hi Layla– your kitchen is looking beautiful! I was wondering if you will seal the paint with anything? We had ours professionally painted (4 coats as well) but didn’t get them sealed because he said they might yellow. Sadly, on the doors under the sink that are opened the most, the paint was wearing off at the tops in less than a year. We are going to have to re-do them and am wondering how we can prevent this from happening again (and want to save you from a possible problem!) Thanks! They look beautiful. I’m painting mine the week of June 8 witha bonding primer from Lowes and Valspar Optimus in White Dove. I had already planned to do it the way you described but I’ve never seen those triangles before. Where did you buy them? It looks fabulous already! I love white cabinets. Can’t wait to see the finished look. :). Are you going to sponge roll a clear coat for durability? Thank you, thank you! I have the paint, also using white, and plan to start on my kitchen cupboards this weekend. I’m a little nervous about it so I have found your posts and others comments helpful and encouraging! I have Skechers and my son plays a mean guitar (previous post) so I guess I’m as ready as I can be! looks amazing! you must be so happy to finally be getting rid of that icky tan color. personally, i like seeing a few brush strokes on painted wood. perfect, perfect paint jobs makes things look a bit like plastic to me. can’t wait to see the finished project! Love the new look so much! Our cabinets are professionally painted (laquered) and they have not held up at all. Lots of peeling paint. Thankfully I don’t go for the perfect look. But if I had it to do over, I’d paint, like you’re doing. You can see about half of my kitchen in my post on cutting up watermelon that I just posted. You really can’t see the peeling paint. One thing my MiL designs into kitchens is cabinets that extend the depth of the frig That little design extra gives lots of storage (it’s where I keep baking sheets and tons of other big flat things), and it’s easy to reach. I can’t wait to see your finished kitchen! Me too! My cabs are 4 years old from a good cabinet company and I have wear already. Good excuse for me to go from cream to white but frustrating isn’t it?? This post would have been so helpful to read before I did my kitchen, haha. Had never painted anything in my life and decided an entire kitchen would be a good place to start 🙂 . Decided to go with Chalk Paint, which was easy, fast and fun. LOVE the look of your kitchen so far! Can’t wait to see the end result! Layla, did you paint the inside of the cabinets? It looks like it, but that’s the step that’s kept me from painting ours. I think I’d have a breakdown. Any tips if you did paint the inside? The color makes your back splash look amazing!! !